The dough covering that encloses the ingredients used to make a small Asian dumpling known as a Pot Sticker or a Wonton. When made, the traditional Pot Sticker begins as a thin, round piece of dough that holds a small amount of stuffing. 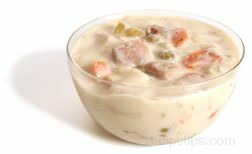 Ingredients for the stuffing may include bits of meats, poultry, fish, shellfish, and/or vegetables mixed together into a small serving and seasoned with spices and flavorings. The stuffing may be cooked before being placed into the wrap or the stuffing may be positioned on the dough and then the round dough wrapper is folded over to form the half circle dumpling. 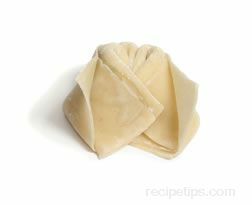 Around the outer edges, the Pot Sticker Wrapper is pinched shut by hand to seal in the ingredients so the Wrapper can be cooked. The Wrapper with the ingredients may be pan fried first and then steam cooked in a pot with fish, meat or poultry broth. When served as part of a Chinese meal referred to as Dim Sum, it is common to have several different foods prepared and served like appetizers or provided as a main meal of which Pot Stickers are only one of items offered.